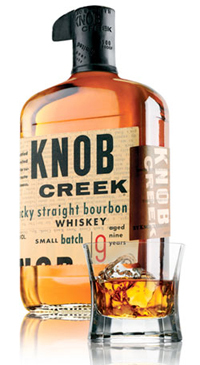 Knob Creek Bourbon was named after a little creek that runs just south of the distillery, the same creek that ran by Abraham Lincoln’s childhood home. Booker Noe, 6th generation Beam and master distiller emeritus created Knob Creek to reflect the strength, flavour, care, and patience that defined pre-prohibition bourbon. It is reminiscent of a bootlegger’s flask with newspaper scrawled on the label, harkening back to the decade’s old custom of wrapping bottles in newspaper at the distillery. Knob Creek strikes the senses with distinctively sweet and rich maple sugar flavours, deep espresso roast, and soothing vanilla.